Winter 2010-2011 is set to be a season of pure glamour thanks to a new prestigious creation from RAYMOND WEIL, the Freelancer Autumn Time. 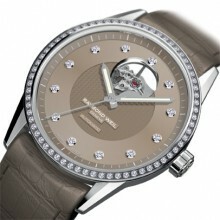 The precision of the mechanical movement is cloaked in ultra-chic femininity, with subtle and warm nuances. A contrast between pure stringency and sophisticated charm, absolutely in tune with the times. the Freelancer Autumn Time collection also seduces by its sumptuous styling, simple yet opulent. 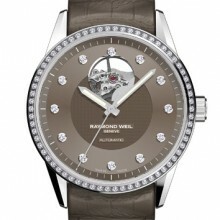 The 38mm polished steel case and bezel are entirely inset with full-cut diamonds of the utmost purity. The dial and flange match the colours of the bracelet – two warm nuances to choose from, chestnut or fig. Rich colours, almost velvety and literally lit up by 12 diamonds on the indexes, the ultimate in sophisticated radiance. For the strap, saddle-stitched full-skin alligator lends its consummate sensual nobility to this RAYMOND WEIL timepiece, the stuff of dreams and definitively out of the ordinary.